Daddy Bowback; Sally Goodin; When I Get My New House Done; Wounded Hoosier; Gray Eagle; Sandy Rive; Cumberland Gap; Lady Hamilton; Snowbird; Possum up a Gum Stump; Cotton-Eyed Joe; Polly Put the Kettle On; Calico; Booth; Sally Goodin; Old Joe Clark; Cripple Creek; Jenny Run Away in the Mud in the Night; Citico; John Henry; Cousin Sally Brown; Boatsman; Walking the Water; Bed of Primroses; Kiss Me Sweet; How the Squire Courted Nancy. The Southern Folklife Collection is part of the Wilson Library at the University of North Carolina at Chapel Hill, and this disc offers an opportunity to enjoy some of the wealth of traditional music in the collection (which includes over 200,000 sound recordings). 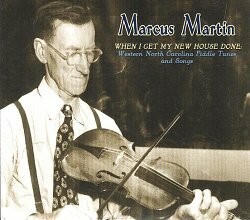 The spotlight is on traditional fiddle player Marcus Martin, born in 1881 in Macon County, North Carolina and recorded by various collectors in the 1940s. Although he died in 1974, Martin had more or less stopped playing by the early 1960s, so was not one of those traditional musicians to be taken up and lionised by the folk revival - perhaps a shame, as he certainly seems to have had a great deal to offer. As well as more than twenty outstanding examples of traditional fiddle playing, the disc includes three songs - two unaccompanied and one on which he demonstrates his skills on the banjo (and the notes inform us that he also played the harmonica and the mountain dulcimer). On many tunes, Martin has altered his fiddle to a ‘cross-tuning’, variously GDGD, GDGB, DDAD, GDEB or GDAD. The different tunings enable him to make the most of harmonising and droning, and his use of such effects is one of the most successful I’ve ever come across. As well as enhancing the musical effect, these presumably also added volume and body to the fiddle’s sound, especially important in situations where it was being played solo to accompany dancing. It seems that he learnt his cross-tunings from his father, who favoured hymn tunes, and although he did play dance tunes, did not play for dances. It would have been interesting to have heard Marcus Martin play a sacred tune, but he doesn’t here, and it seems churlish to complain too much. He does play tunes that probably derive from songs, such as The Wounded Hoosier and Booth, although in Martin’s hands, the latter is effectively a dance tune. The former sounds more like a listening tune to me, even if there may have been dances that suited it - either way, it is a beautiful performance in the DDAD tuning, rich in harmonies. On a couple of tunes, he not only cross-tunes the fiddle but also drops it one and a half steps below standard pitch. His reasons for doing this are described in the notes as a mystery, but maybe it was just for the sake of variety - perhaps he simply liked the sound of it that way. On both of these tunes, he briefly sings a verse or two, so maybe it was related to where he felt comfortable singing. Both are very fine, Citico in particular. There are some rare tunes, such as Sandy River (‘not documented from any of Marcus Martin’s contemporaries in western North Carolina’), which has a particularly fine B part, where the strands of the tune somehow seem to weave in and out of each other. Snowbird appears more common, but it’s an unusual tune, possibly of Native American origin, at least in part, and Lady Hamilton while played as a dance piece, has some odd characteristics, including key changes that mark it out from the traditional repertoire. The notes suggest that it might originally have been a military band piece. Other selections are more standard - Sally Goodin, Old Joe Clark, Cripple Creek and Cotton-Eyed Joe are all here, although Martin is able to invest them with a distinctive character and quality, as all good traditional musicians can. Marcus Martin was also a lovely singer, and in customary gift-horse-in-the-mouth fashion, I can’t avoid saying that I’d have loved to hear more. As already mentioned, he interjects verses into a number of the dance tunes, but there’s a few full songs. His unaccompanied rendition of Bed Of Primroses, is very good, a version of the Irish song whose title is more often given as Erin’s Green Shore. Martin sings ‘long Erin’s green shore’, which suggests that the original might have been ‘Lough Erne’s green shore’, indicating a Fermanagh origin. The comic How the Squire Courted Nancy might, I think, be related to the song usually found in the British Isles as The Keach In The Creel or The Trooper And The Maid. The title and the ‘fol dol’ chorus suggests this version originated in England, although I thought I picked up some Irish touches as well (e.g. ‘devil the one would let him in’). His excellent John Henry is accompanied by his banjo, in the clawhammer style. According to the notes, his banjo technique had an unusual characteristic (picking ‘up on the first string on the off beat’) which he shared with Samantha Bumgarner, one of the very first Southern traditional musicians to make a record (and it’s a pleasing surprise to see the photograph of Martin and Bumgarner playing together on the back of the pack). Again, this brief glimpse of his banjo-playing only makes one wish that we could hear more. Among the collectors whose work is included is Artus Moser, who made a couple of albums of North Carolina songs for Folkways, and he is to be heard at the beginning of each of the tunes that he recorded, saying in slightly exaggerated tones ‘What is the title of this selection, Mr Martin?’, but the other tracks indicate that Martin had a tendency, anyway (whether prompted or otherwise) to announce the name of the tune before playing it. These small snatches of his voice lend a little more to our portrait of this fine musician, and tribute should be paid to the Southern Folklore Collection for preparing this outstanding document of his life and work. Presentation is attractive (there’s a Shanachie/Yazoo look about it, so it wasn’t surprising to see that Richard Nevins was closely involved in the project) and the booklet notes by Wayne Martin and Steven Weiss, on Marcus Martin and his life, as well as each of the tunes, are exemplary.